Gandalf has been at Collectable Cats since he was a kitten. 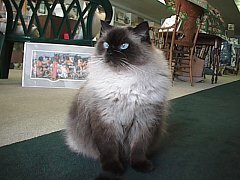 He was a gift to the owner when the store opened in 1987. 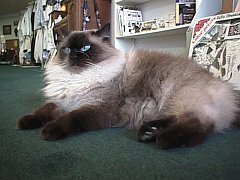 He is a Himalayan, about 14 pounds. He often sits in the window on "Mannequin Duty," making some people stop and argue if he's real or not. There is an antique doll bed in the window bought for diplay. Gandalf has claimed it as his own. If anyone puts anything on display on the bed, he knocks it off and climbs on the bed himself. Another job he has is "watch cat". Whatever is going on in the store--he watches it. He is famous around Kent, and has been in the newspaper. 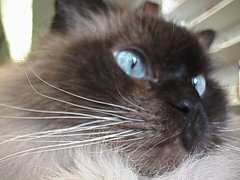 Note: Gandalf passed away February 7, 2002. He will be greatly missed. 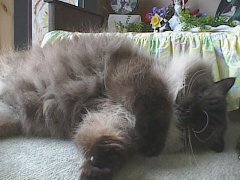 A new Ragdoll kitten should be succeeding him soon.